Madge and Harold are practising their ballroom dancing - specifically the tango (or at least, that's what it looks like!) Harold is really enjoying the dancing. Madge is finding it a bit empty without Henry and Bronwyn, but it's not all that empty because Henry has sneaked in through the back door and is spying on their dancing. Henry has popped round to get some LPs so he and Bronwyn and "do some dancing of their own". Skinner and Todd are having an argument. 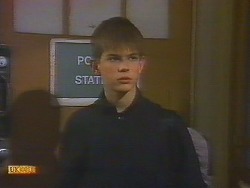 Todd is worried that Nick will be in trouble with the police and thinks they should try to help him by confessing themselves. Skinner won't hear of this though and is worried that Nick will dob them in. 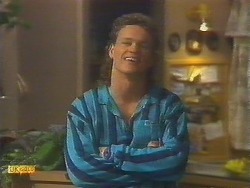 He warns Todd not to take Nick's side. Beverly has been paged yet again. Helen is distracted - she's very worried about Todd. They sit down together and Beverly tells her not to worry herself into the ground. Helen wants to go to the amusement arcade once more, but Beverly says she'll go on the way to the hospital, just in case Todd is there. 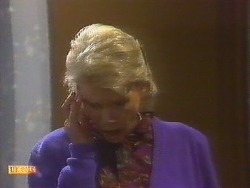 When Beverly has gone, the phone rings. It's the police ringing about Nick - he's being held at Burrow Street Police Station. Helen sighs as she puts the phone down and feels a slight pain in her temple. But she brushes it off and heads off the the police station. Joe is upset that he has been pushed out of a job. 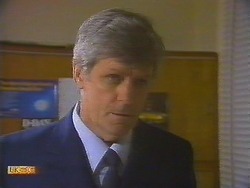 He tells Jane he's fed up of being treated badly by his work colleagues. She suggests he takes up the job at the Coffee Shop - at least it's steady income. 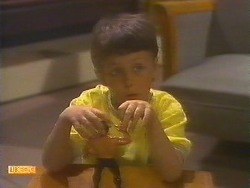 Just then the doorbell rings and Joe opens it to find Nolene (Toby's mother) there. JOE: Oh God, I knew it was all going too flaming well to last! He is not pleased to see her. She's got Toby with her and tells Joe he's coming to stay with him. Joe is speechless. The police explain that they caught Nick coming out of a warehouse, but he won't tell them anything other than that he wasn't stealing. 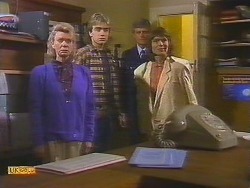 The police show Helen in. Nick is upset that he's let Helen down. She knows that he went looking for Todd, but Nick won't say anything with the police there. Nolene is laying into Joe - it took her forever to track him down. JOE: Why are you here? NOLENE: So happens I'm getting married again. Yes. Think I'd know better after what I went through with you, wouldn't you! Must be a glutton for punishment. 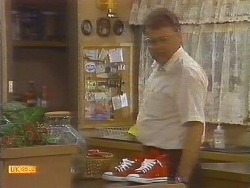 JOE: I still don't see what this has got to do with me, Nolene. NOLENE: Well, think about it. I've had Toby all on my own for the past six years. I reckon I'm entitled to a bit of time to myself while me and Ted are settling in. JOE: No way, Noels! When you nicked off you shut me off completely! Didn't matter about my rights, did it! I didn't know where he was, what was happening to him, nothing! Well, as far as I'm concerned, no rights - no responsibility. Tough! Jane intervenes and says they shouldn't talk that way in front of Toby. Nolene says she doesn't want to fight with Joe - she just wants him to take Toby for two months. NOLENE: How about it? For old times sake? You owe me this, Joe. Todd wakes up in the night, picks up his bag and sneaks out. Skinner is asleep. Toby is up in the middle of the night, crying. Joe gets up and Toby says his room is creepy. Joe sits down with him and tells him not to cry. He doesn't think Toby should be playing with dolls, either. He shoos Toby back to bed. Jane is up too and tells Joe off for being hard on Toby. JOE: I don't want my son growing up to be a wimp. Beverly has arrived and Helen tells her that Nick has been arrested for breaking and entering - but she thinks he's covering for Todd. Beverly says Nick has a lot to lose and goes off to tell Nick what's what. Just then, Todd turns up, and tells them that Nick didn't have anything to do with the break-in - Todd is the one the police want. Henry creeps into the house early in the morning and raids the fridge. He hides out in the laundry when he hears Harold coming. Toby is watching cartoons when Joe gets up. He turns off the TV and tells him to go and get dressed. Henry has put on his pyjamas to fool Madge and Harold that he's slept in his own bed(!) However, he lets slip to Madge that he saw Mike leaving early this morning. Sprung! Madge says that he and Bronwyn must be pretty serious - she's pleased to see him happy, but wants him to be sure that he doesn't do anything to spoil it. Henry thinks that Bronwyn is "the one" and he can see marriage and kids in their future. Bouncer is licking Toby to death and Jane fends him off. She has a chat to Toby in the garden and says it's very scary to move somewhere new, but you soon get used to that. She suggests she takes him round to meet Katie. TOBY: Only sooks play with girls! Jane tells him not to take too much notice of Joe's rantings - that's just the way he is. TOBY: He isn't my dad! Mum said I haven't got a dad! He isn't my dad! Beverly is shouting at Todd that he's very lucky he only got an official caution. But she's so pleased to see him and tells him to promise not to run off again. They hug and Beverly tells him that he was very brave to own up. Beverly also apologises to Nick for not making him too welcome in the house. From now on, he's a member of the family - she's very grateful to him for finding Todd. 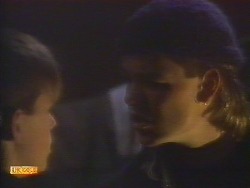 NICK: Don't worry, mate, I'll be there to back you up. BEVERLY: We all will, won't we, Helen? ...Helen! For Helen is sitting bent over on the sofa. It looks like she has had a stroke.